“Peyote with a Twist—Not Crochet” is a technique for using even-count peyote stitch to make cylindrical ropes that look similar to bead-crocheted ropes. The similarity is in the slant and the relative position of the beads. 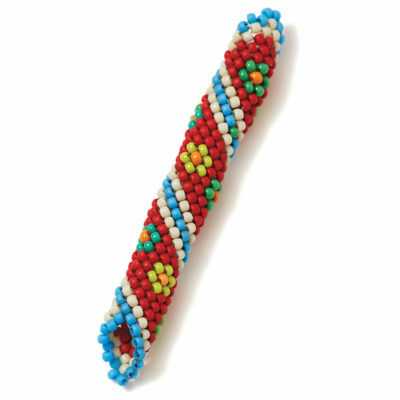 The beads form narrow coils or rings around the tube, unlike in tubular peyote stitch. 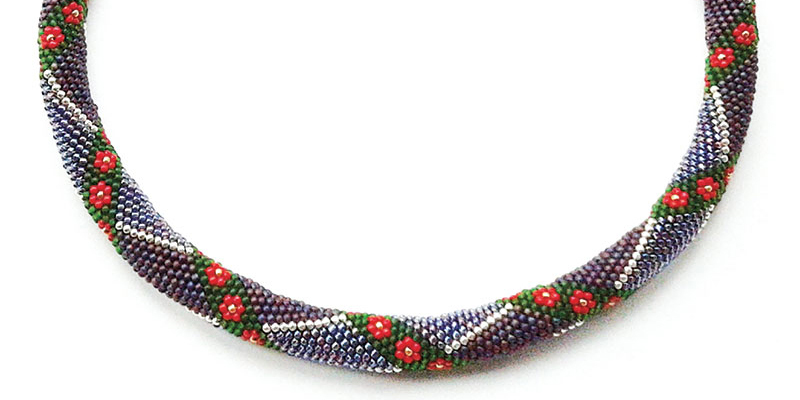 Peyote with a Twist bracelet formed using single-seam construction: 9-bead circumference, size 8° seed beads, 10.2mm inner diameter glue-in end caps; finished length 8¼”. 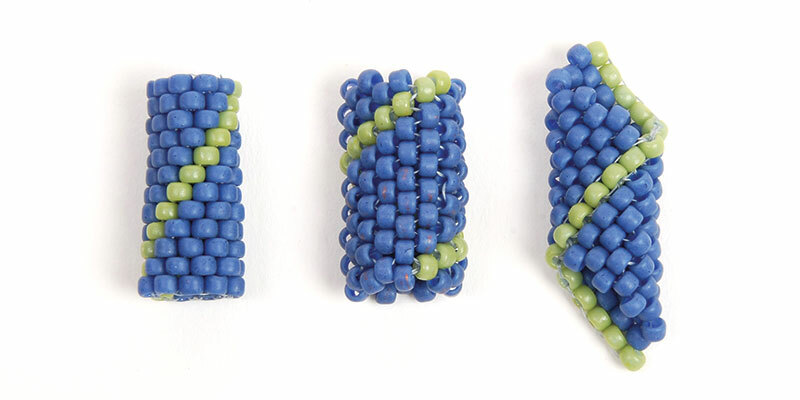 Three types of peyote-stitched tubes: Left, formed by zipping the first and last rows of a peyote-stitched rectangle together; middle, woven as tubular peyote stitch; and right, woven as “Peyote with a Twist.” The green beads form the seam column in the Peyote with a Twist sample but are only used for effect in the other two. The mechanical properties of the tube are best when the offset (in rows) is equal or nearly equal to the circumference of the tube (in columns). To demonstrate this principle, use a small rectangular piece of paper to form a tube by placing the short edges against one another. 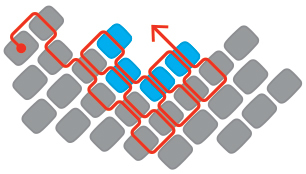 Then shift the short edges sideways— the edges are now offset. Shift the edges further, until the corners meet and one edge starts where the other edge ends. This is the offset used when closing Peyote with a Twist tubes. The other two corners form tips. Most charts for Peyote with a Twist patterns start at the top right, so that the last bead of the first row is the first bead of the left column. This bead is the one used to close the tube after the number of rows needed for the offset has been reached. 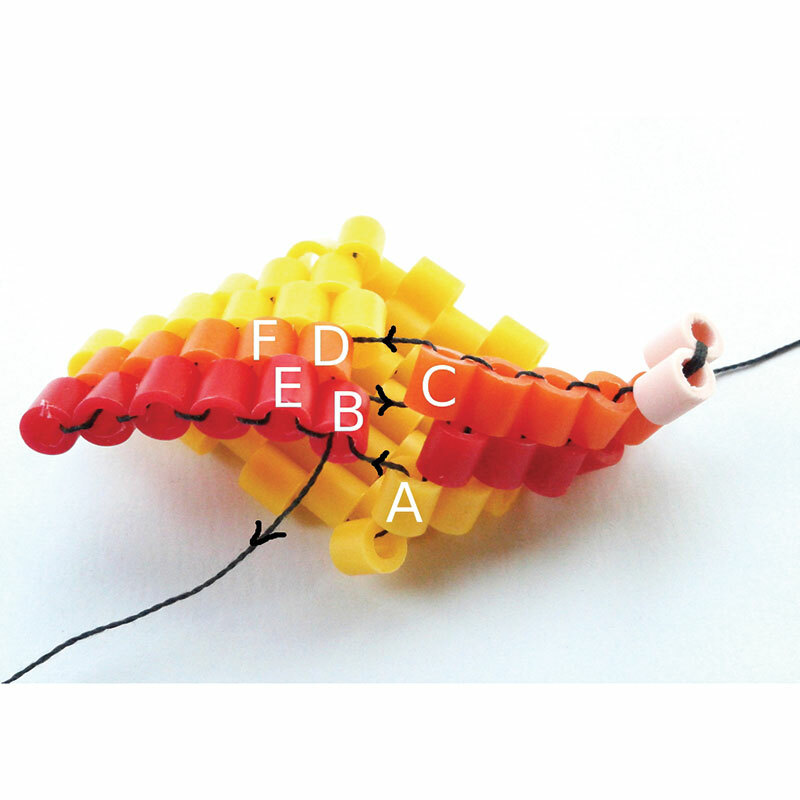 Since the bead is pulled to the end of the right edge to close the tube, the working thread is at the right edge of the rectangle, as is the tail thread. The offset depends primarily on the pattern used. For example, the offset for patterns translated from bead crochet is two rows greater than the circumference. To get started, use one-drop even-count flat peyote to stitch a rectangular piece of beadwork with a contrasting color of beads used along each edge. Theoretically, we could start with an odd-count peyote-stitch rectangle for odd-numbered circumferences and start stitching the new rows in the other edge of the rectangle after the offset. However, this approach is cumbersome and unnecessary—instead, we start with an extra column, which is taken up when the tube is closed. 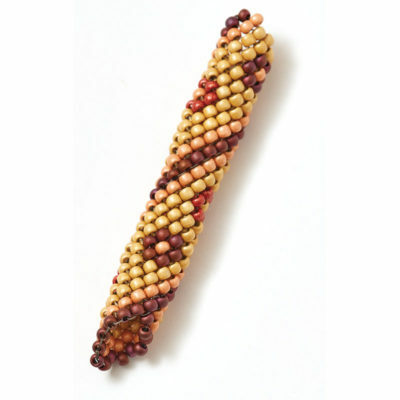 In this example, we start with a sample that is 10 beads wide by 11 rows high, for a circumference of 9 beads. 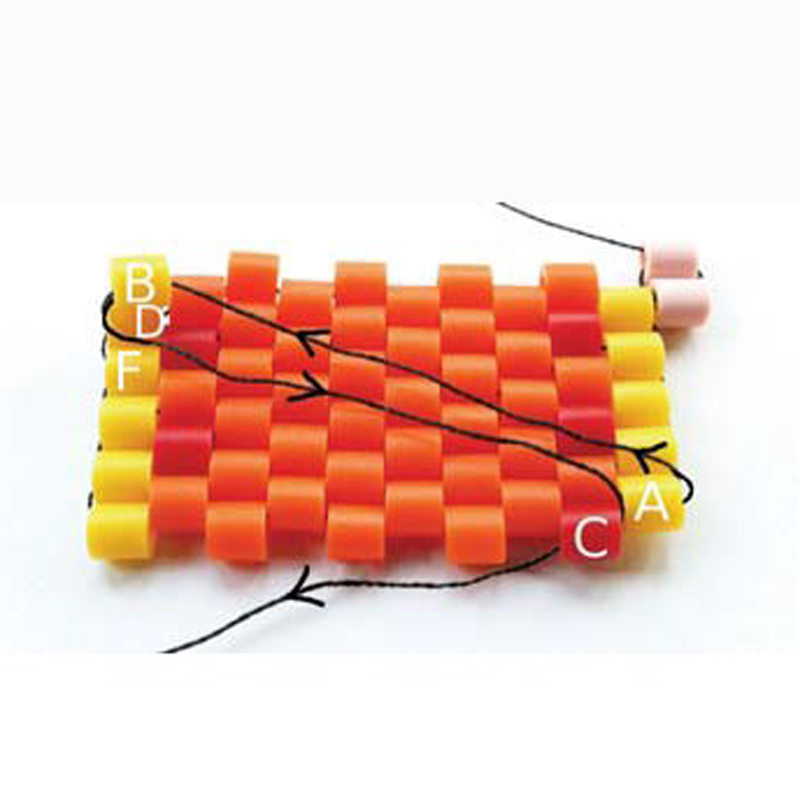 After completing the last row pass the thread from the first bead of row 10 (A) through the last bead of row 1 (B; the closure bead) to the last bead of row 11 (C). Once the tube is closed, the beads will be added from the seam to the tip and back to the seam (often referred to as “up and back down”). These new rows are started with the beads in the seam column. Continue working up and down, adding rows until you’ve reached the desired length from tip to tip. An even-count circumference requires a double- column seam so that we can still work the tube as even-count peyote. 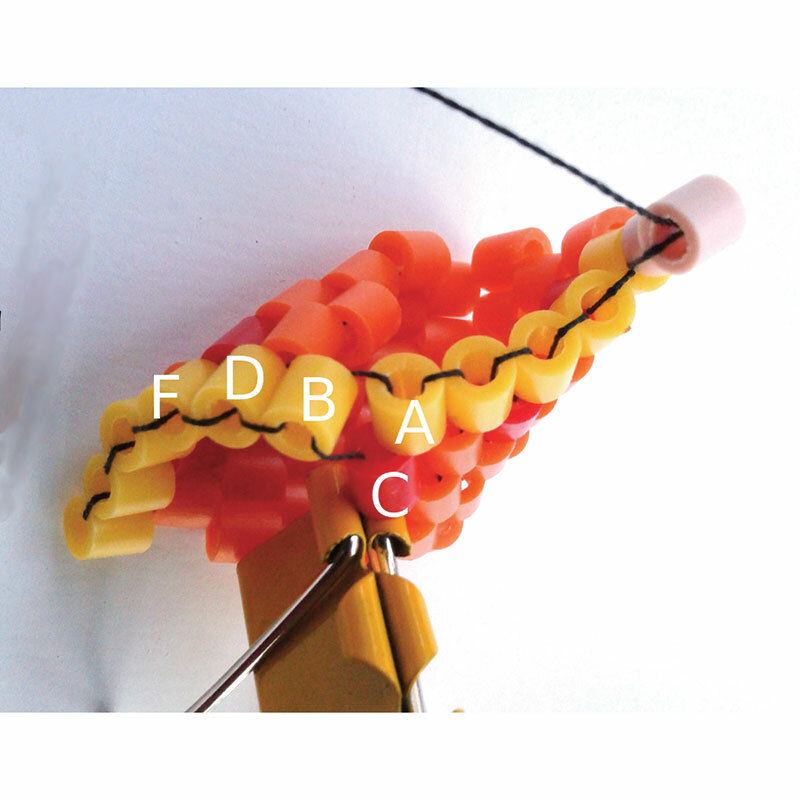 To accomplish this, 2 beads are added to the desired circumference count, allowing for the two edge columns from each side to be joined to form the seam of the tube. The offset is still equal to the circumference, but instead of replacing the first bead of the next row (which would be at the left edge like in the single-column seam), we replace the last bead of the next row with the last bead of the first row (the closure bead). In this example, we use a stitch sample that is 12 beads wide by 10 rows high. 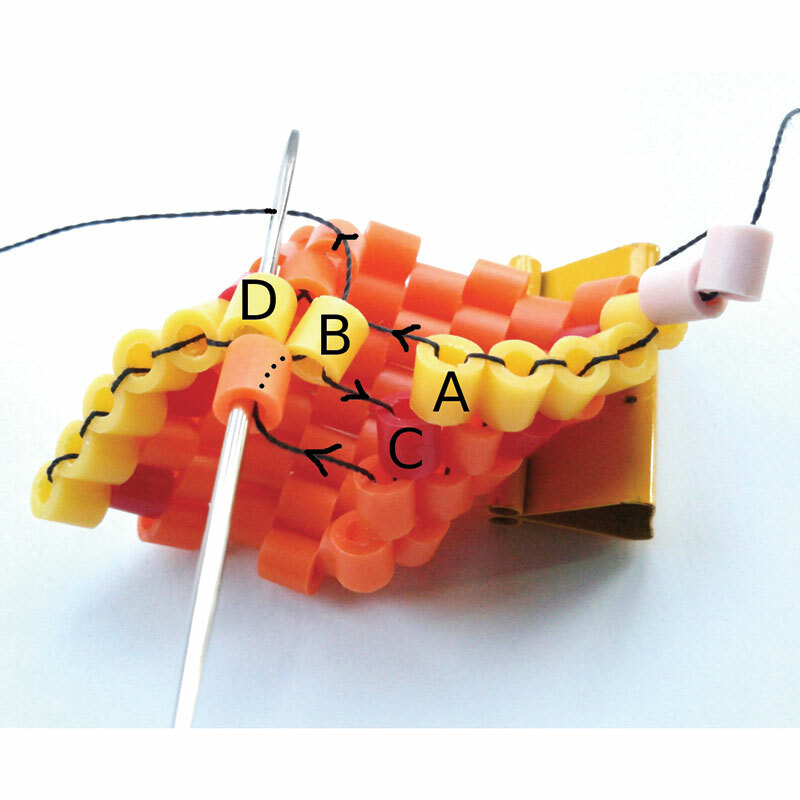 With a doublecolumn seam, this will yield a tube with a circumference of 10 beads. Weave row 11 up to (A), which is 1 bead short of a full row. 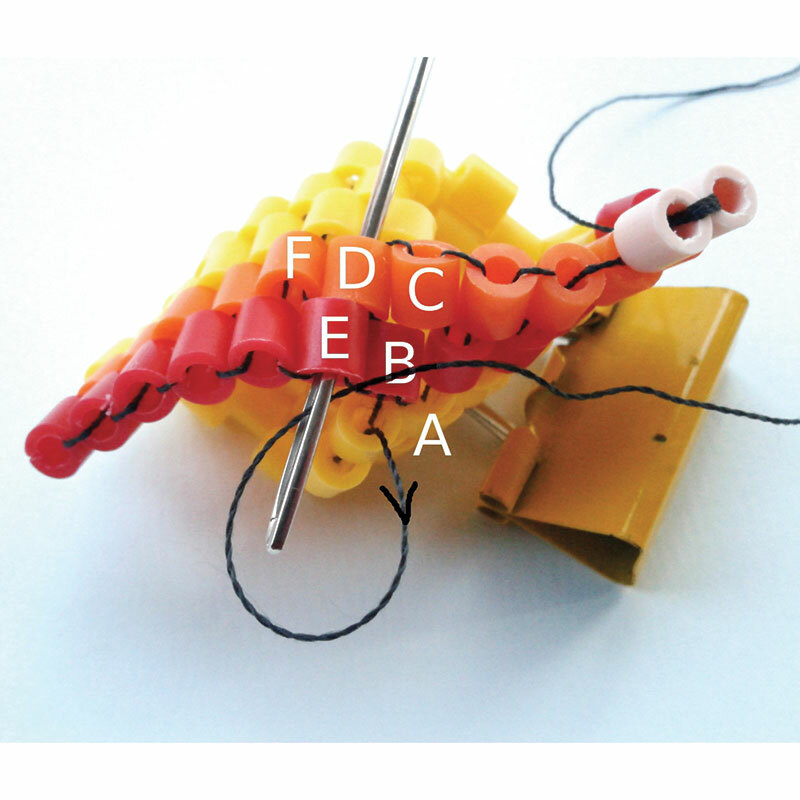 From the second bead of row 10 (A), pass through the last bead of row 1 (B) and the first bead of row 10 (C), through (D), and back through (B). 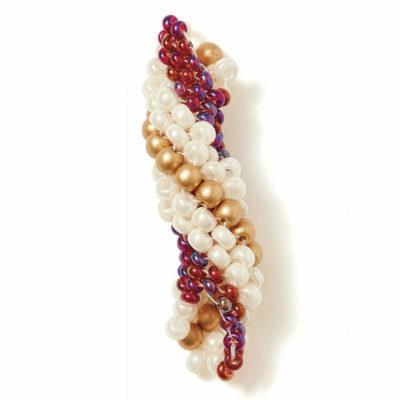 Pull the beadwork together, then pick up a bead to continue row 12. Like for the single-column seam, weave even-count peyote stitch to the tip and back down to the seam. At the seam, pass through (E) then (D); turn and pass through (F) and back through (E). Now you’re ready to pick up the first new bead for the next row toward the tip. Tip: Start with a tail thread about 8″ long; it creates a useful handle when you begin stitching. You can also use the tail thread to continue building the tube in the other direction or when finishing the end of the rope. 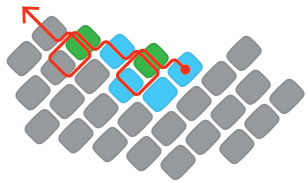 To finish the ends of the rope, fill the valleys with consecutively shorter rows, as in Fig 1. 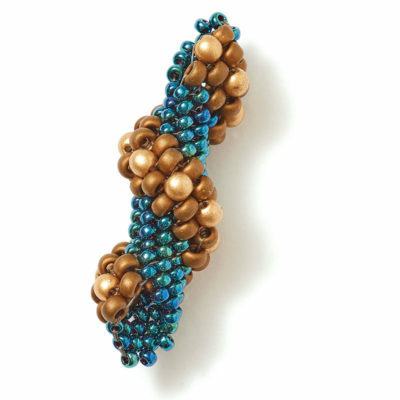 Fill the remaining gaps with single beads, as in Fig. 2. If you want the end of the rope to contract, simply add beads between the beads that stick out. If maintaining the slant is important, use square stitch to attach the beads to a neighboring bead. The flat rope ends can be closed like the back side of a bezel. Alternatively, you can cap the ends with a kumihimo end or a bead cap. Stitching a beaded cap from the same beads as the rope results in an end that matches the rope precisely. I invented Peyote with a Twist because I couldn’t get the hang of bead crochet. 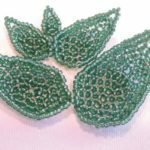 You can translate most bead-crochet patterns into a pattern for Peyote with a Twist, although currently the process is a bit tricky. The thinnest Peyote with a Twist rope I’ve created has a circumference of 4 beads; the thickest I’ve stitched is 22 beads around. Other beaders have used Peyote with a Twist to create shapes that I would have thought were impossible—so there’s no telling what the future holds for this technique. You can use Peyote with a Twist to mimic many beaded designs, including bead crochet and Cellini spiral. 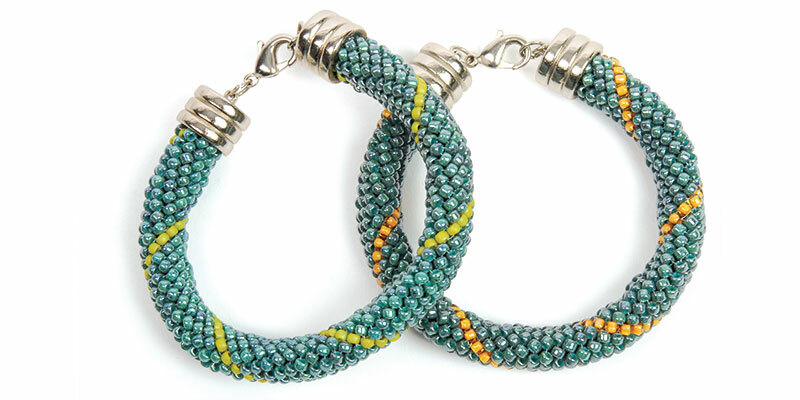 GERLINDE LENZ enjoys pushing the limits of bead-weaving techniques. She invented Peyote with a Twist, which is a peyote-stitch technique that creates tubes resembling bead crochet. She also invented Diamond Weave, and she coauthored the book Diamond Weave (CreateSpace, 2015). You can find Gerlinde on Facebook. Editor’s Note: Gerlinde Lenz deferred her payment for this article to the Rocky Mountain Bead Society as a donation. This article was originally published in the June/July 2018 issue of Beadwork magazine. 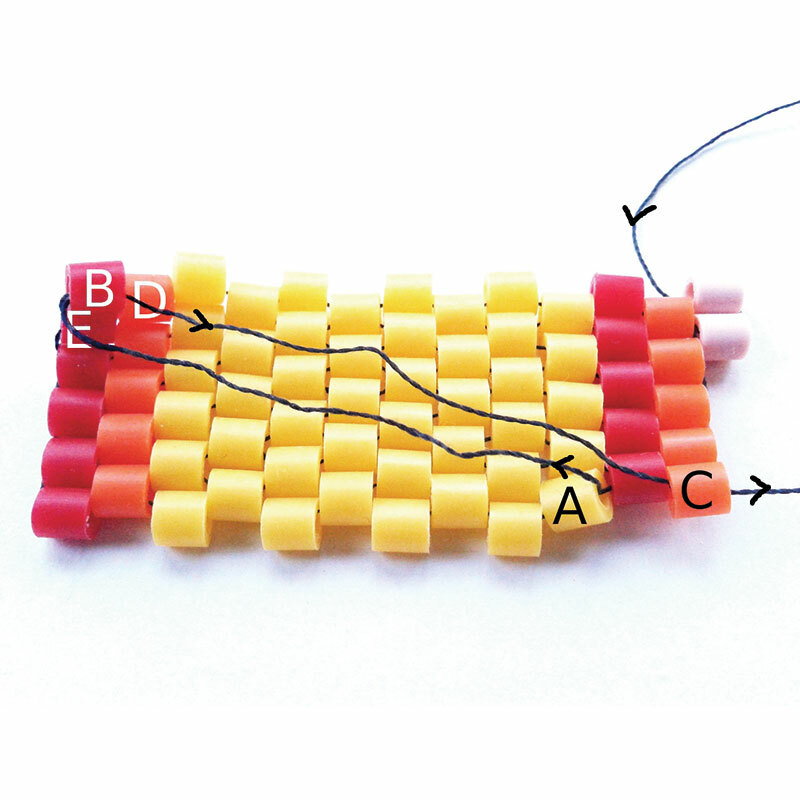 For more on bead weaving techniques, check out the Stitch Tips department in future issues or visit the Interweave store. For more tips and tricks, go to the Interweave Store. Sadly, the picture supposed to show the rope closure steps for single column seams does show the steps for double column seams instead. Thank goodness it is correct in the magazine article. I hope you can quickly correct it here, too. Otherwise, I thank you for this feature. This has been corrected in the post! Thanks! The rope with the flowers was designed by Susan Sassoon. Interweave does not sell that pattern.